Yuval Levin, editor of the domestic policy journal National Affairs, praised Jindal on Saturday morning for "thinking creatively about how to use the strengths of his state to build on its weaknesses. Freshman Sen. Ted Cruz (R., Texas) included Jindal in a list of several politicians whom he called the "children of Reagan" during his lunchtime address on Saturday. "I think there are four or five Republicans who have what it takes to be president of this country. He’s one of them," former Congressman Artur Davis said at the conclusion of the conference. Jindal spoke candidly as he presented his vision for the Republican Party’s future. "Ours is a party, ours is a movement that can handle candid discussion," he said at the beginning of his remarks. Jindal challenged Republicans to look beyond the partisan battles in Washington, D.C.
"America is not the federal government," he said, but Republicans have begun to focus solely on the problems with the federal government. "We seem to have an obsession with government bookkeeping," he said. "As conservatives, we are falling into the sideshow trap," he said. 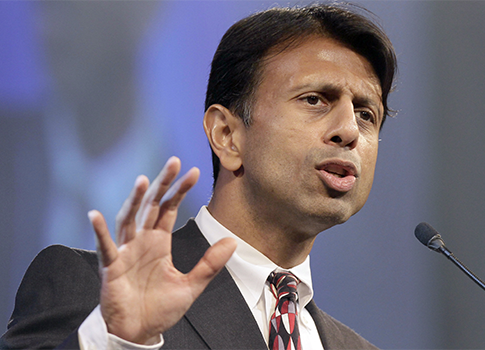 Jindal asked whether Republicans should sign up "to manage the slow decline of America?" "That’s what we have Democrats for," he said, to laughs from the crowd. He challenged Republicans to engage Democrats on the level of ideas, seeking to "win the argument." He gave two examples of reforms he is seeking in Louisiana: tax reform and education reform. Jindal passed the largest tax cuts in Louisiana’s history, but he said the code remains too complicated. As a result, he is trying to restructure the tax code by eliminating the income tax. Jindal is also pursuing education reform by making "the dollars follow the child," he said. Jindal also gave a laundry list of changes the Republican Party should make. He said the Republican Party should "stop looking backward" and instead talk about America’s potential. He encouraged Republicans to "compete for every single vote" and "reject identity politics." And he said the Republican Party must "stop being the stupid party." They must "talk like adults" and stop making "offensive and bizarre comments." At the conclusion of his speech, Jindal said, "America is facing her greatest choice." "We can either go down the government path or the American path," Jindal said. Republicans must win the argument, he said, and after that, they will win the next election. Steve Churchill, an Air Force reservist in attendance at the conference, praised Jindal’s emphasis on engaging with people’s ideas. "We have to be willing and free to talk to people who don’t necessarily agree with us," he said. "The principles he spoke of I think were wonderful," Churchill said. Rich Lowry, editor-in-chief of National Review, noted that Jindal picked up on a theme that arose throughout the weekend: "conservatives need to freshen up their message." "I think his message is exactly where the party needs to be," Davis said about Jindal’s speech. This entry was posted in Politics and tagged Artur Davis, Bobby Jindal, Journalists, Media, National Review Institute, Obama Administration, Obama Economy, Republican Party, Ted Cruz. Bookmark the permalink.